If you search "investing" in Amazon's books department, you'll get over 70,000 results. Over 99% of the investing books out there aren't worth the time it takes to read them. Some books are just magazine articles that book publishers expanded into hundreds of pages of fluff. Some books are full of academic blather that doesn't apply to the real world. Some books are OK, but don't hold a candle to the best ones... so they aren't worth your time. This is a major problem for people who want to build a basic investment education. You want to build a foundation of basic stock market knowledge, but with tens of thousands of titles out there, where do you start? If you're someone who realizes the power of education, I've written this list for you. Below is a list of the best easy-to-read books on how to identify great businesses... how much you should pay for them... and how you can use them to safely compound your wealth for a long, long time. • The very first investing book I recommend anyone read is The Elements of Investing, by Burton Malkiel and Charles Ellis. This is the only book I've encountered on the basics of investing that begins with the correct first investment topic: saving money. Hanging onto a big sum of money without blowing it is by far the single most important investment skill of them all. That is the one skill without which you simply can never be an investor. Other essential topics in the book include compounding, diversification, avoiding blunders, and keeping your investment strategy simple. From cover to cover, every word of this book is essential reading for the novice stock market investor looking to start out on the right foot. Amazon Price: $5.46. • Then be sure to read Peter Lynch's book, One Up on Wall Street. It'll teach you how to think about the overall stock market and how to spot good businesses to buy. Lynch is famous for encouraging investors to buy what they understand. For example, just about anyone can go to the grocery store and look around at various products, comparing those he likes with those he doesn't like. Amazon Price: $10.58. • Lynch's next book, Beating the Street, is great, too. It goes into detail about specific industries – like retail, real estate, savings and loan, cyclical industries, and restaurants. Lynch also offers his 25 golden rules of investing, which are incredibly valuable. Amazon Price: $10.79. • Now you're ready to get into the nitty gritty of business valuation. Start with Joel Greenblatt's The Little Book that Still Beats the Market. It's easy to read and easy to understand. It'll teach you a simple investment approach that boils down to: Buy good businesses at cheap prices. Amazon Price: $14.66. • Then read Joe Ponzio's F Wall Street. This is a must-read mostly on the strength of the second section, called "How to Approach Investing from a Business Perspective." It has a great chapter called "How to Value a Business." This chapter boils business valuation down to two core sources of value creation (cash flow and net worth). Ponzio says if a business isn't causing one or both of these sources of value creation to increase, forget it and move on. That's great advice. You don't want to waste time with a business that's shrinking. Amazon Price: $14.36. • Frank Singer's little book, How to Value a Business, teaches you a simple formula for business valuation. It also shows you the simple math that explains why a business is worth so much more to a so-called "strategic acquirer" than it is to anybody else. (For example, Mars buying Wrigley in 2008 was a strategic acquisition because it improved Mars' position in the candy market.) Amazon Price: $15.54. • Lastly, I'd recommend Greenblatt's You Can Be a Stock Market Genius. It has specific approaches that show you how to find great stocks. It's where I learned about the value of spinoffs – when a company distributes the stock of a subsidiary, making it into a separate publicly traded company. The book covers other types of stocks, too. It's considered required reading in the hedge-fund industry. Amazon Price: $9.43. Keep in mind: There are a few other great investment books out there. Chapters 8 and 20 of Ben Graham's The Intelligent Investor and Warren Buffett's Berkshire Hathaway letters are world-class educational material. But the above list will get you started on the right path. It's a list focused on the best easy-to-read books that explain how to identify and value great businesses. You can buy all of them new for under $100… and much less if you buy them used. If you're interested in building long-term wealth in stocks, read these books and forget the rest. "Investing is work. There is absolutely, positively no way around it," Dan writes. "And in the end, you are on your own as an investor." Everyone in the financial industry is working for himself, so you need to watch out for your own money. Learn the ultimate way to protect your money in this market here. Managing your own money is much simpler than most people think it is. The reason people think it's complicated is that Wall Street wants it that way. That's why Dan says not to ask fund managers or brokers about managing money. Instead, "ask millionaires and billionaires who made their money buying and selling stocks, bonds, and real estate," Dan writes. "They'll tell you what to do... and it'll actually work." Get all the details here. After taking a "breather" last month, the uptrend in tech stocks is back on. Longtime readers know that the tech sector has been a favorite of ours in recent years. Back in September 2010, Steve Sjuggerud pointed out how many of America's elite tech companies were trading at extremely low valuations. You just had to account for their giant cash hoards to realize it. Our "Big Cheap Tech" idea includes the biggest and best companies in the sector. Companies like Microsoft, Intel, and Apple have thick profit margins, generate huge amounts of cash, and pay growing dividend streams to shareholders. 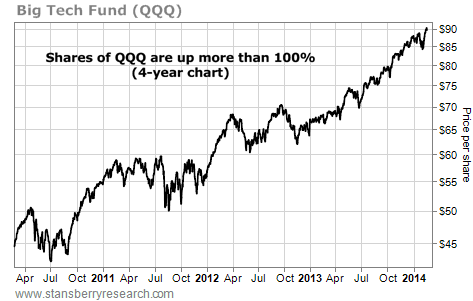 Below, you can see the steady uptrend in shares of QQQ, a popular sector fund. It's a "one click" way to own 100 of the biggest names in tech. Like most areas of the stock market, tech stocks "took a breather" in January. Last week, the uptrend resumed. Shares of QQQ broke out to a fresh 13-year high. The uptrend in Big Cheap Tech continues.